« BULLET TOOTH Offers FREE Summer 2012 Album Sampler! That’s it at the top! That’s my cool Barq’s Metal Bites cassette tape! Plus it’s still sealed with its original plastic wrap! I bought this cool cassette for 50 cents (U.S.) at a thrift store about a year ago. I haven’t opened it cause I listen to cassettes rather infrequently. Barq’s is a brand of root beer, owned by the Coca-Cola Company. I’ve recently seen this Barq’s Metal Bites cassette on ebay with a “buy it now” price of $10 (U.S.) and that doesn’t include shipping of $2.75. Eventually I’ll open this cassette and play it. In the meantime, it’s part of my Metal collection. Barq’s Metal Bites mystery: I’m not certain if this cassette was ever sold in record stores. 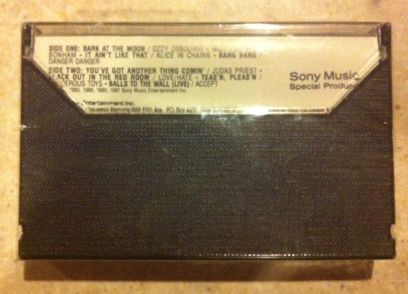 I would guess that this cassette was used as a promotion/giveaway; preferably in a grocery store. Who knows? 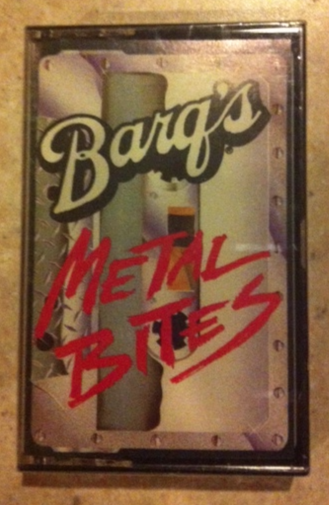 * To the best of my Metal research, this Barq’s Metal Bites cassette was released back in 1991. The record label is Sony Music (Special Products). * For more info on Barq’s Root Beer, click on the link below! This entry was posted on July 28, 2012 at 12:10 am and is filed under Hard Rock, Heavy Metal, heavy metal albums, metal music, Music, rock music, rock music news with tags barq's, barq's metal bites, heavy metal albums, heavy metal cassettes, heavy metal compilation albums, Metal News, root beer. You can follow any responses to this entry through the RSS 2.0 feed. You can leave a response, or trackback from your own site. Pretty neat. Always liked that Dangerous Toys song. The Barq’s tapes were a “send in two upc’s and some shipping $$ and they send you the tape” I was one of the first 1000 people to send it in, so they sent me two. I used one and kept one in the cellophane. I recently gave it to a good friend.